Officially known as the Kingdom of Cambodia, the fascinating country of Cambodia borders Thailand, Laos and Vietnam. Populated by over 15 million people, the country’s social landscapes are sculpted by its history, cultures and archaeological landmarks. Popular attractions include the Angkor Archaeological Park in Siem Reap, Choeung Ek in Phnom Penh and the pristine beaches of Sihanoukville. 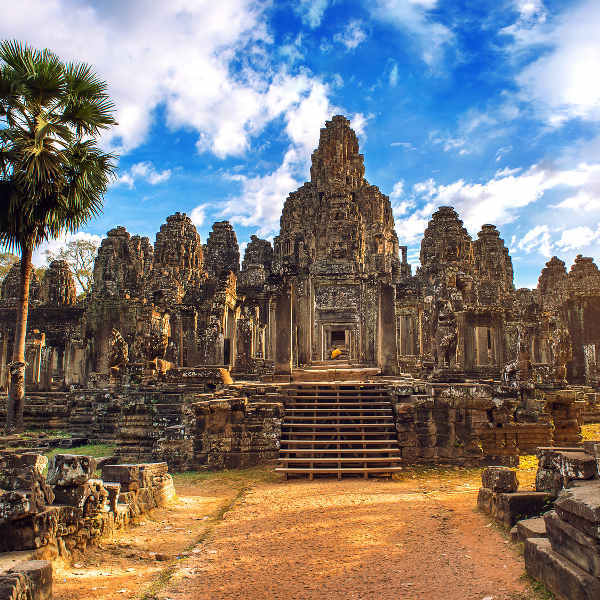 Immerse yourself in the captivating heritage and culture of the Khmer people because cheap flights to Cambodia are now available! The country’s hub airport is Siem Reap International Airport (REP), a 15-minute drive from the city centre. The grand temples of Angkor are, no doubt, Cambodia’s biggest drawcard. Off the beaten track you’ll find the decaying ruins of Prasat Preah Vihear and Banteay Chhmar, a 12-century old temple surrounded by sprawling jungle. Cambodia has a profound history deeply embedded in its landmarks and its people. 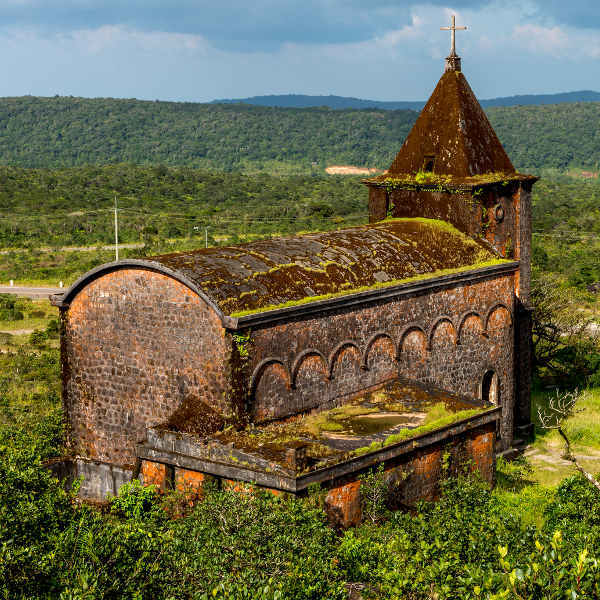 The veteran town of Kampot is brimming with history and an old-world charm; while Phnom Penh’s Killing Fields reveal the atrocities of the former Khmer Regime. Experience the richness Cambodia has to offer, with its tropical beaches, ethnic minority villages, colonial buildings and bamboo-lined floating villages. You’ll soon appreciate the simplicity and charm that embodies the culture of the Cambodian people. Cambodia is a year-round travel destination, with two distinct seasons. The dry season runs from November to March, while the rainy season is between May and October. While the cooler dry months are more popular amongst tourists to visit the temples and beaches, the rainy season is just as good a time to go, as the afternoon rain showers don’t really hinder travel plans and the streets are less crowded, with half-price accommodation to match. The temples of Angkor are always busy, and with the intense heat and humidity, it is best to visit them at sunrise or sunset. Phnom Penh experiences mild temperatures, while the sun-kissed beaches and islands off the south coast are brimming with activity between December and April. Cambodia celebrates a wealth of traditional and international festivals throughout the year. Pchum Ben in September sees the Buddhist temples filled with locals celebrating their ancestors and making traditional offerings. A landmark festival is King Sihanouk's Birthday Celebration on 31 October, when the streets of Phnom Penh are ablaze with music and parades, bringing together people from around the country. If you find yourself in Cambodia around mid-April, be prepared for ornate decorations, joyous faces and water pistols to bless everyone in celebration of the Khmer New Year. With its majestic temples, turbulent history and vibrant energy, the intoxicating atmosphere of Cambodia will uproot and transport you to a place of humility and wonder. Home to the 8th wonder of the world – Angkor Wat – Cambodia’s real treasure is actually its people. Despite having struggled through years of torment and political warfare, the resilient spirit and optimism of the locals have triumphed, leaving behind a sense of admiration and affection. The vast landscapes offer a unique experience in each city. The unrefined capital of Phnom Penh is the economic heartbeat of the nation. With its cosmopolitan flair in the way of upmarket hotels and riverfront dining, the city has bounced back from its former days of decay, home to the Royal Palace and National Museum. A day trip out of town will reveal the horror and brutality of the killing fields of Choeung Ek and Tuol Sleng S21 Prison. Siem Reap is the much-loved jewel of Cambodia, with its regal temples and charismatic night markets. After a day touring the main temples of Angkor Wat, Bayon and Ta Prohm, treat yourself to a heavenly foot massage. The glittering night markets are teeming with rich fabrics and wooden carvings, while the aromas of traditional cooking spill out into the streets. Intrepid travellers can visit Cambodia’s outback along the dusty roads of Ratanakiri to ethnic villages, gibbon conservation parks and adventurous jungle trekking. The laidback lifestyle and charming architecture of Battambang and Kampot make it impossible to leave. Explore the floating villages along Tonlé Sap, with its rustic churches and schools fashioned out of bamboo. Head south towards the scattered beaches and island of Koh Rong. Spend your days lazing in hammocks and going scuba diving, while the tropical nights are made up of pulsing beach bars and restaurants. Compare several airlines, and book your cheap flights to Cambodia today! 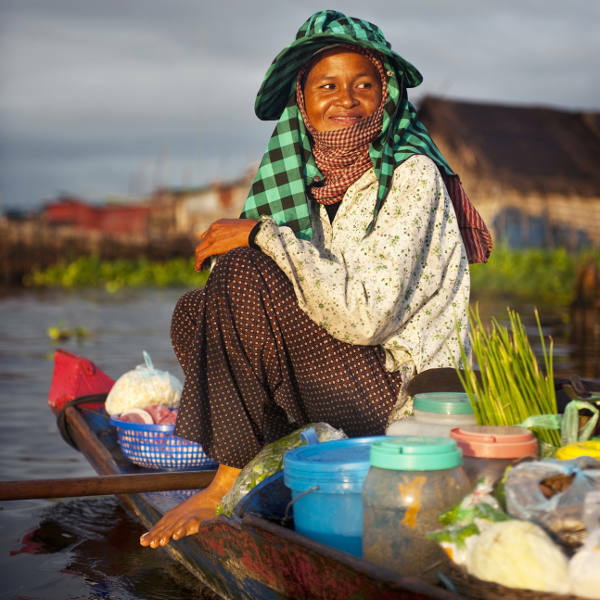 While Cambodia is still very much a developing country, the undeniable warmth and hospitality of its people make up for its primitive way of life. A good sense of street savvy and vigilance will serve you well, as some locals may try to scam you into buying tours, souvenirs and tuk-tuk rides. Tourists are common targets for petty theft so keep belongings close-at-hand and leave extra money and valuables locked away in your hotel. Cambodia is an incredibly poor country, so any sign of wealth will attract street children and hawkers. When visiting the Angkor temples, be respectful and dress modestly, or you may be refused entry. There are no required vaccinations for entry into Cambodia, although it is strongly recommended to be immunised against typhoid and hepatitis A as you may be exposed to contaminated food and water. Definitely try the street food, but beware of poor hygiene. Stick to bottled water only. Cambodia has an increasingly high rate of HIV/ AIDS, particularly in Phnom Penh where many local women try to lure foreign men into strip clubs and brothels. Malaria is no danger in the cities, but if you plan on venturing into the countryside, consider taking anti-malaria medication. Dengue fever is also widespread, so it’s best to bring along a good insect repellent.